This morning. No wait, yesterday morning, (I'm writing this ahead of time because I am going to be in an undoubtedly packed Sam's Club tomorrow) I awoke full of hope and confidence. I had a list of objectives to complete, and most of them involved a fair amount of shopping. Which is always fantastic. 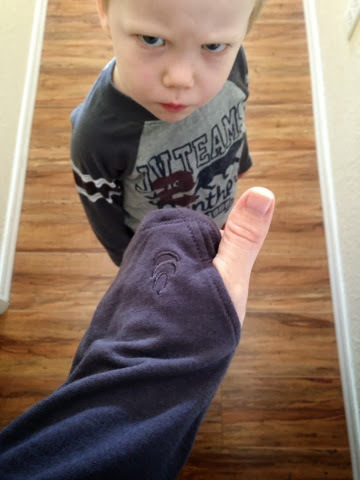 I also got to wear my brand new thumb hole sleevie shirt. Notice the grumpy face. It is a sign of things to come. Maybe. Not really, he makes that face often. The girls need a few more fillers in the winter wardrobe. Only part of last year's clothes still fit. (I know- super lucky) And boy if buying little girls' clothes won't perk up a morning. Little Man had been asking for more breakfast, merely an hour after breakfast had officially closed up shop and gone home for the day, then suspiciously changed his story to "not feeling good." Husband and I both started flicking back through the archives of our memory for any suspicious behavior. Our best guess was a bit of constipation and gave him a choice to stay home and try and work it out or come on an outing to "Pretzel Store," aka: Sam's Club. He opted to go, so first up was Carter's. At the front of line I waited to check out. The associate looked up and apologize "I'm sorry, but our computers are completely down, we're doing everything by hand, so this might take a while." My mind could not wrap around the reality of what was happening here. I would soon find out, though! These poor employees were writing all the sku numbers down BY HAND on carbon copy paper. They had the old-timey credit card swipe thing that made imprint impressions. It was like blasting back in time. The whole thing was super tedious. Add in my coupon, and it spiraled downward rather quickly. I'm no mathlete, but I was pretty sure my poor cashier was bungling my total. I tried to be really nice about it, but really, I'm not going to overpay either. I have a handwritten receipt and everything. It was madness. I cannot imagine how the world could function without technology by this point. I kinda think they should have closed down the store entirely until the system could be brought back up. That's what *I* would have done... instead of having to use a real-not-on-a-phone calculator. Cut to: We're in the car & I MAY have spent a small fortune on really cute ruffly pink shirts. And I'm feeling a bit of shame. I guess the shame part is superfluous to the story. We're keeping it in anyway! So Little Man is continuing to say he isn't feeling well, (he stayed in the stroller during the entire mall trip, a refreshing, yet suspicious surprise) now he wants to go home. He says he needs to go potty. Then at the next light, he doesn't. I'm waffling between getting the Sam's run done while it's only SLIGHTLY crazy as opposed to the day before Thanksgiving when it'll be completely bonkers. We decide to err on the side of caution and take him home for a little potty break. We can always head back to Sam's for the big soft pretzels everyone adores. Me: HOOO NO. Remember last time we had the stomach flu? You made me clean up my OWN ralph! I think since you're on "vacation" you should take one for the team. He needs his mommy to comfort him anyway. Why is it you never pick up the puke? Husband: BECAUSE I cannot HANDLE IT. Me: OOOOH! And I CAN?! Husband: It's just so... gross! Me: YEAH, I KNOW. IT'S GROSS FOR ME TOO. Sorry about all the puke-talk. Anyway, Little Man seems to be much improved after a nap and dinner of bland, not brightly colored foods. I'm bracing myself for the circus that is sure to be the store on the day before Thanksgiving. What's worse is the bulk of our list is just regular household stuff like toilet paper, clorox wipes, & stuff. Obviously, we'll still purchase a pie or two, but we don't NEED the pies. Here's to hoping we don't get trampled!